”Eyesect” is a wearable interactive constellation that reflects a disembodied experiment in immersive ways. By this it allows users experience their environment from new points of view. The world, as we perceive in reality and through media, is aligned with binocular and stereoscopic vision of human beings. This omnipresent human-centrist perspective and the critical debate about contemporary 3D technology that only simulates real space and does not simulate the lust for new visual ways were the starting point for the work on ”Eyesect’. The question ‘how do we not see?” and the fascination for the cybernetic – spiritual utopias, science fiction and bionic experiment – led to the development of one helmet device and two freely attachable camera eyes. Two handheld cameras capture the surroundings and stream the image data straight to the single eyes. The spatial perceptions are constructed inside the human sensory system. Arms and fingers become eye-muscles and create impossible human-biological perspectives. External world will be designed in a new way and ”Eyesect” critically requests the users with his or her visual/spatial customs and technology augmented individualism. The helmet device has an amorphic, broken and metal-coated surface. The eyes, which many cultures are considered as the treasure of the soul, are not where they are supposed to be. Users of the ”Eyesect” look different, in both meanings. For themselves they experience space in a complete new visual manner and external beholders are not able to catch mimic or any facial expressions. What they see is a distorted reflection of themselves in their own environment. And that’s just a slightly idea of what happens inside the helmet. The Constitute is a small blend of design studio and academic institute which was created in 2012. 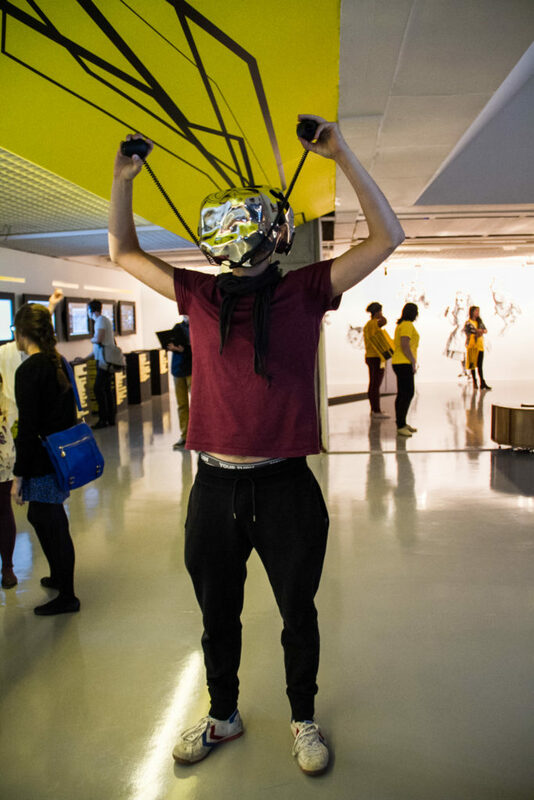 As VR/urban they’ve been showing the SMSlingshot worldwide and The Constitute does so with more diverse projects with a critical approach, all of them in public spaces and using technology as a creative material. Christian Zoellner and Sebastian Piatza are trained designers, passionate music fans, and researching weirdos par excellence.